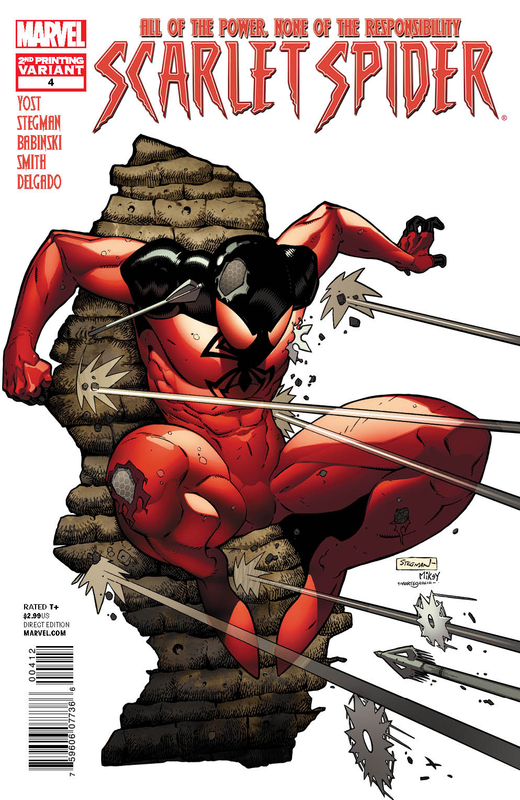 The Scarlet Spider is an alternate Spider hero mantle worn in the Marvel Universe. It is typically worn where there is already a Spider-Man. Different men have worn this mantle, this post will focus on the Kaine version. Kaine is an interesting character in that he has gone from being a crazy serial killer to a super hero. Kaine is extremely important in the Spider-Verse storyline because he is the "Other" a special spider-totem needed to beat the villains the Inheritors. As a hero his fighting style is much different than the 616 Peter Parker Spider-Man. If you want to know what Spider-Man would like fighting full out, not holding himself back, watch Kaine. People are punched through walls, bones are snapped, and people are flung around like rag dolls. In short his fighting style is swift, lethal and brutal. The first appearances and story as Kaine. Kaine is the first clone of Peter Parker made by the Jackal. He began following SpiderMan lurking in the shadows during the Clone Saga storyline. Due to him being the first clone he was somewhat flawed, leaving him disfigured and mentally unstable. While seemingly defected he also has some enhanced powers. His Spider-Sense acts as a full on precognitive ability that gives him visions of the future. He also has a corrosive acid touch that he uses to put burned hand print marks on the faces of his victims. He calls these hand print burns the mark of Kaine. This hand print ability seems to be a mutation of Spider-Man wall cling capability. He was initially a villain envious of Peter Parker and feeling rejected by him. He saw Parker as something of a father figure. He is far darker, and morally ambiguous than Peter Parker. He is much more willing to kill, murder and even assassinate to meet his goals. Kaine believes that Ben Reilly (The 2nd clone of Peter Parker) is actually the real Peter Parker. While this belief is inaccurate (Stemming from a file switch by Norman Osborn) Kaine stalks Ben Reilly. Kaine wants the clone who he believes is Peter Parker to live a normal happy life, and the real Peter Parker to live a miserable life. He thus commits various murders to frame to Ben Reilly and even kills his loved ones. It is easy to frame Ben because the two share the same fingerprints. Kaine tracks Ben Reilly to New York where he begins having visions of someone harming Mary Jane. Trying to prevent this Kaine goes on a murderous rampage killing anyone he thinks could hurt Mary Jane. He kills Doctor Octopus and the Grimm Hunter. Peter Parker is eventually imprisoned for these crimes. Kaine is under the control of the Jackal and is primary Spider-leader of the Jackal's army. Kaine falls into a vat of Anti Venom Symbiote that was planned to be used to cure the city. The Anti Venom cures Kaines cellular degeneration and fragmented mind. He is now a perfect clone of Peter Parker. Curiousily, his mind is now more stable, and he even gains something of Peter Parker's humor. Kaine is given a special Stealth suit from Madame Web. It allows him to turn invisible and also protects him from Sonic Attacks. He is called the Scarlet Spider while wearing the suit even though he is not fond of the name. Kaine moves to Houston and begins a super hero career taking on the moniker the Scarlet Spider. There he begins to create a new life for himself as a hero / fugitive. He is joined by a supporting cast that includes Aracely, Annabelle, and Dr Donald Meland. Aracely is especially important to the story she is a 16 year old Mexican girl who has prophetic powers. Kaine joins forces with Agent Venom to hunt down Carnage in the Microverse. In this story Kaine nearly kills Carnage but is forced to save a ally called the Redeemer at the last second. Carnage is the abducted by the Marquis Radu. Kaine has managed to save the Microverse but Carnage is still alive. Aracely begins having visions of her missing parents, and the Sixth Creation of Aztlan. She is abducted by a drug cartel called the Lobos who are Werewolves. The Lobos are run by a Mr. Moctezuma who wants the 6th creation to begin. During this story Kaine is effectively killed by the Lobos. However, on the verge of death he is met by the mystical Spider Entity known as Ero. Ero also met Peter Parker in a similar situation in the story "The Other". Ero tells Kaine that he can be saved if he accepts the Other. The Other means fully accepting the Spider side of himself over his human side. He bursts back to life in the form of a huge monstrous spider and begins attacking everything. He nearly kills two of the werewolves forcing them to flee. He then attacks Aracely but she manages to reach his human side. Then a more human Kaine rips out of the husk of the Spider body. Aracely calls him her "Champion". In this way Kaine becomes the mystical Other entity, the special Spider-Totem that leans closer to his mystical spider side. As the Other Kaine can grow spikes and jaws that can powerfully cut and maim even the most powerful of foes. He joins the New Warriors as a veteran fighter. The Spider-Verse unites all the versions of Spider-Man / Woman across all dimensions to defeat the Inheritors. The Inheritors are a powerful family of villains who are killing and eating Spider-Totems ( Spider-Men) and are trying to wipe them out. The Inheritors control entire worlds and are able to cross between dimensions to hunt down Spider totems. Kaine is rescued by a team of Spider-Men in Amazing Spider-Man #10. He is called out as being the "Other" and thus one of 3 important Spider-Men to defeat the Inheritors. In Amazing Spider-Man 11 the Spider army is attacked and many of them die in the Spider-Man 2099 universe. The Spider forces realize that any time an Inheritor is killed he is instantly replaced by a duplicate. They assume these duplicates are clones of the originals. Kaine, Ben Reilly and a Black Widow / Jessica Drew go through a portal to learn where the Inheritors are cloned. In Scarlet Spiders #1 Kaine's team finds the in world of Jennix. Jennix is the intellectual Inheritor who appears to have entire world devoted to creating various types of clones. Clones of normal people and super-heroes to do his bidding. The team confronts an evil version of Iron Man and learn that Jennix's headquarters is in the Baxter Building. Kaine's powerlevels have changed throughout his history. Generally his powers are very similar to Peter Parker (616) but tweaked. In his first set of stories his powers were different due to his cellular degeneration, now they are different due to his embracing of the Other (Mystical Spider side of Spider-Man). He has no restraint on using his powers against anyone. Strength - Same as Spider-Man (616) normally. After embracing the Other he is more powerful. Super Agility Same as Spider-Man (616). Note his agility is equal despite being stronger, and sometimes larger. Wall Crawling Ability- Can cling to surfaces with any part of his body. He also has difference to Spider-Man in that he can use this ability to leave a mark of his hand on a person. He uses this as his calling card when he was a serial killer it is called the Mark of Kaine. Sting of Kaine - Has been shown to have a variety of bones, spikes coming from his arms. Now with the "Other" powers he can create spines coming out of various parts of his body that can be used to impale, stab people. Communication with Spiders - Kaine has a greater control of psychic senses than Spider-Man and can communicate and command spiders. Spider-Sense - Initially, Kaine had a more powerful form of Spider-Sense that allowed him see the future. However, he lost his Spider-Sense altogether in the events of Spider-Island. Other Powers - In addition to the ability of creating deadly spines and jaws as the Other, Kaine can also fully transform into a huge monstrous Spider. In his Spider form he does not retain his full intellectual capacity and is thus a foe to friends and foes alike.